Slim Jxmm, 24, and Swae Lee, 22, were born in California, but moved to Tupelo at an early age, where they were raised in the notorious Ida Street housing projects, some of the worst, most crime-ridden in the state. Making matters worse, Sremmurd's parents split while the brothers were still young, a devastating turn of events that found the brothers multiple stretches, seeking shelter in abandoned homes scattered throughout the area. For a city with little history outside of its musical heritage, and in a state where two young kids short on role models could look up to the growing star power of in-state hero David Banner, music, from a young age, became a way for Slim and Swae to escape the desperation of their surroundings. 'When we were growing up, it was just about perseverance," says Slim Jimmy, before flipping a quote made famous by Stark Trek character Richard Wakinyan. 'Regardless of the situation, we couldn't let the haters win." The movement started locally, with the brothers throwing parties and shows around town, often in the same abandoned buildings where they once stayed. The pair always had larger ambitions, though, and so the brothers, natural performers since elementary school, taught themselves how to record, make beats, and DJ, building enough buzz to earn an appearance on the popular 'Wild Out Wednesdays" segment during BET's music video countdown show, 106th & Park. Back home, Swae and Slim earned the attention of fellow Tupelo native P-Nasty, who also happens to be a producer signed to super producer Mike WiLL Made-It's Eardruma production team. 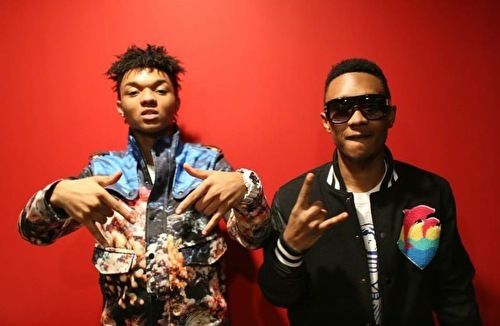 P-Nasty introduced Rae Sremmurd to Mike WiLL, and the multi-platinum producer (Rihanna, Jay Z, Kanye West, 2 Chainz, Future, Juicy J) was instantly impressed by the brothers' energy and the quality of their music, signing the duo as one of the first acts to his new, Interscope-backed label, Eardruma Records. 'When I met them," recalls WiLL, 'they just had a real young dope energy about them. So me and the Eardruma team locked in the studio like we normally do, had a lot of fun, and cooked up some amazing music. This is just the beginning of our working relationship, and they've got a bright future. I believe in them."